Cook potatoes in salted boiling water until slightly tender, but still firm in the center, about 7 to 12 minutes. Drain well and set aside to cool completely. When cool, shred using the large holes of a box grater. On a large baking sheet, add broccoli and drizzle with 1 tablespoon oil - season lightly when salt and fresh ground black pepper, then toss well to coat. Spread broccoli out into an even layer - roast, stirring once halfway through, until just soft and browned in spots, about 15 minutes. Meanwhile, in a large skillet, heat remaining tablespoon oil over medium heat. Add beef and onion - cook, stirring to crumble beef, until the onion has softened and the meat has cooked through and begun to brown, about 10 to 12 minutes. Stir in garlic and cook until fragrant, about 1 minute. Stir in Worcestershire garlic powder - season with salt, then remove from the heat heat and set aside. In a large saucepan, whisk together milk and cornstarch. Bring mixture to a boil, whisking often, over medium-high heat until thickened enough to coat the back of a spoon, about 6 to 8 minutes total. Remove from the heat - stir in cheddar, 3/4 teaspoon salt and turmeric until the cheese has melted. Divide the beef mixture between 6 to 8 individual baking dishes coated with nonstick spray. 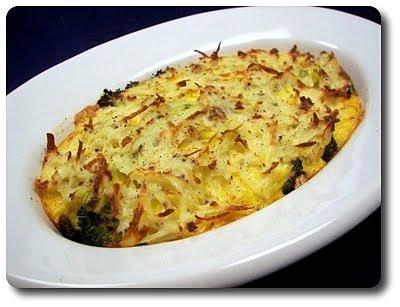 Top each portion with an even amount of the broccoli, then divide the cheese sauce evenly over the tops. In a medium bowl, add cooled shredded potatoes, egg, black pepper, paprika, cayenne pepper and 1/4 teaspoon salt - toss well to coat. Sprinkle evenly over each baking dish, then lightly coat the tops of each with cooking spray. Place into the oven and bake until bubbling and the potatoes have begun to brown, about 35 to 45 minutes. Remove from the oven and sprinkle with additional paprika - set aside and allow to rest for 10 minutes before serving.